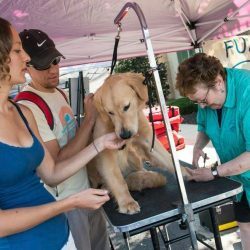 Boyertown, PA: Building A Better Boyertown is pleased to announce the annual Dog Days of August event on Saturday, August 18. The pet focused event will be held just off E. Philadelphia Avenue on North Chestnut Street in downtown Boyertown, between Robin Zimmer’s Pets, and Tompkins VIST bank from 10 am to 1 pm. This community event is open to the public, and their furry best friends. Building a Better Boyertown invites you and your favorite pet to come and enjoy the splash pools provided by the YMCA promoting the upcoming Yip and Dip event, nail trimmings for a donation by Fuzzy Days, hot dogs and sodas supplied by the Boy Scouts, and visit the pet themed vendors and crafters. Studio B would love to invite you to have some fun in the sun and have your dog’s portrait taken in that beach themed studio by photographer Tammy Snyder. This event is generously sponsored by Robin Zimmers Pets Inc. and GiGi’s At Home Pet Care. Pet watering stations will be hosted by various locations out front of downtown businesses. Please stop by the BaBB table for a map. Parking will be available in the Town Center Parking lot and along S. Reading Avenue. For more information about Building A Better Boyertown, this event, and other Boyertown activities please visit boyertownpa.org or contact Adrianne Blank, Main Street Manager for Building A Better Boyertown at [email protected] or contact Emily Jones, Assistant Main Street Manager at [email protected]. Building A Better Boyertown is a non-profit Main Street Revitalization Organization that is dedicated to the revitalization of the designated Downtown Boyertown community. We provide outreach, business retention assistance, business recruitment for vacant properties, visual merchandising assistance, façade grant assistance, promotional events, and more, per National Main Street’s Four Point Approach to communities. Building A Better Boyertown is an advocate for the Boyertown Community initiative and is active in many partnerships which promote revitalization and reinvestment our community.